Would you like to use the award-winning Picture-Perfect Science series but don’t want the hassle of tracking down the trade books that accompany each lesson? 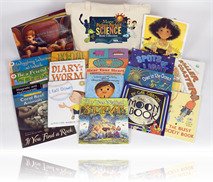 At teachers’ requests, NSTA is now offering a collection of more than two dozen hardcover and softcover picture books referenced in the popular More Picture Perfect Science Lessons. All the books fit inside a zippered canvas tote bag with a screened image of the book cover on it. This bundled set is a great value--especially compared to the retail cost (and effort) of buying the books separately.